If you purchased a VIP pass, which grants access to the show all five days and gets you in 30 minutes early, then you will get a goodie bag with special cards for VIP guests. 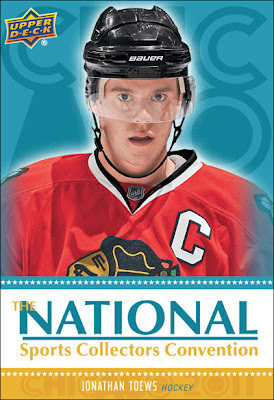 In it you will find a five-card Upper Deck set with exclusive cards of hockey superstars Connor McDavid and Patrick Kane. VIPs will also have access to the VIP Reception (Wednesday at 2:30 pm). Three retired athletes will be signing autographs for free, including former New York Rangers star Ron Duguay. 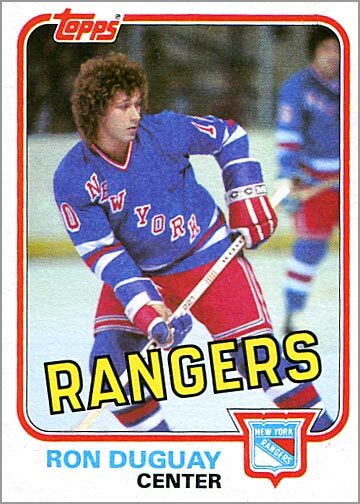 If you are not attending as a VIP, Duguay will be signing free autographs for all attendees later that day at 4 pm. Throughout the weekend, many retired NHL greats will be signing autographs: Ed Belfour, Ray Bourque, Chris Chelios, Phil Esposito, Bobby Hull, Brett Hull, Guy Lafleur, Cam Neely and Jeremy Roenick. The cost of an autograph from each of these athletes vary; dates, times and costs can be found on the TriStar website. From Thursday to Sunday, Upper Deck will be giving away packs of cards that make up a 20-card set exclusive to The National. 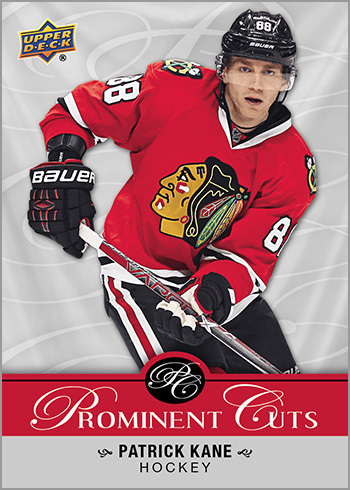 Since Upper Deck has the exclusive license to make NHL trading cards, this set is going to be packed with NHL greats; in fact, 15 of the 20 cards are of current and former NHL stars. Even better, you can pull an autographed card in these redemption packs. 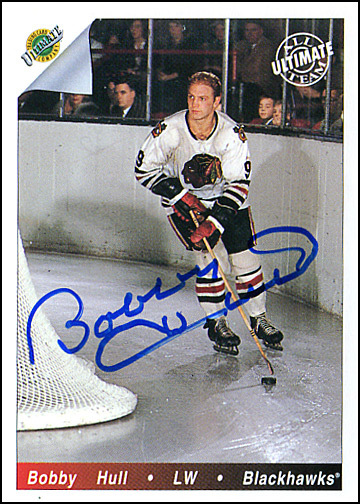 (At past shows, I’ve gotten autographed cards Sidney Crosby, Bobby Orr and Jonathan Toews.) Full details on how to participate is on the Upper Deck Blog. 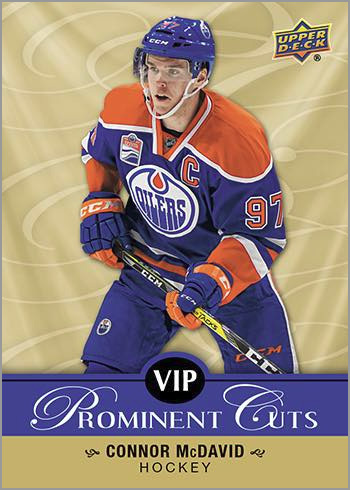 In a nutshell you buy packs of certain hockey cards at the show from designated dealers, get these special coupons, then redeem your coupons to get the special redemption packs. 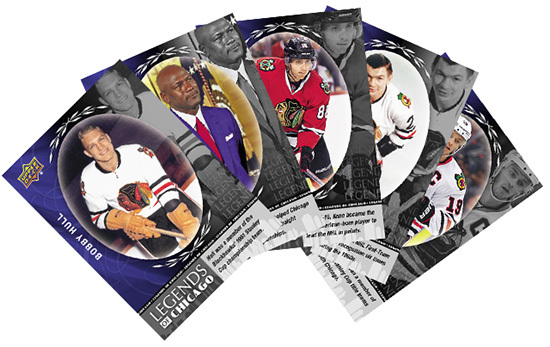 Upper Deck will be holding another redemption program that focuses on “Chicago Legends” like Bobby Hull and Stan Mikita, as well as some current Blackhawks and greats from other Chicago sports teams. Full details on that can also be found on Upper Deck’s Blog. 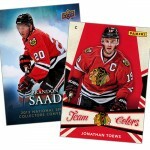 Leaf Trading Cards will also have a redemption program aimed at hockey collectors. If you buy a box of 2016-17 In The Game Used Hockey while at the show, you will get a Jack Eichel memorabilia card with a piece of Eichel’s game-used jersey on it. 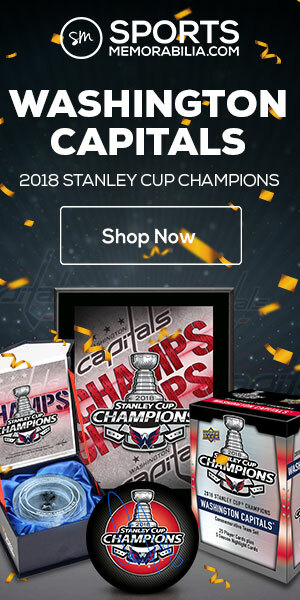 Those who buy an entire case of ITGU Hockey the complete five-card Jack Eichel memorabilia set and a card autographed by Nico Hischier and Nolan Patrick. Hirschier and Patrick were selected first and second overall, respectively, at the 2017 NHL Entry Draft last month. The last time I attended The National, I visited the Topps both, and one of the employees was giving out free coins for their various digital trading card apps. 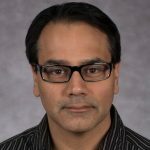 They would ask for your User ID, and a few moments later you’d see the coins in your account. I scored a bunch of coins for Star Wars Card Trader and Topps Bunt. 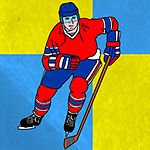 Now that the company launched its Topps Skate digital hockey card app, I will definitely check in and see if they are giving free coins again this year. I am not sure if they will or not, but if you play and collect with the Topps Skate app, then it is worth a try. You can easily spend a day at The National just looking at the seemingly endless sea of tables with items for sale. There is so much to take in. That said, take your time and look. 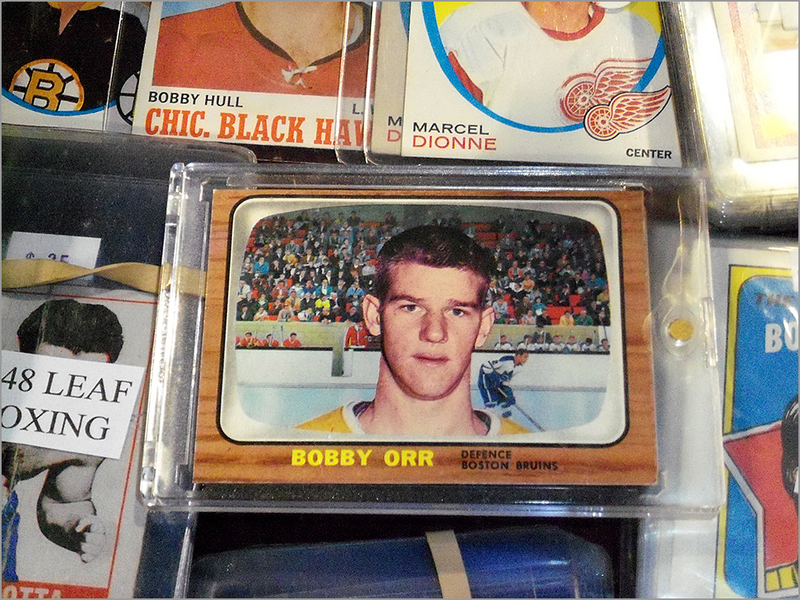 You will find dealers selling hockey cards; you might find a few who are exclusively hockey, but will likely find many who have a lot hockey cards, game-used sticks and jerseys, programs and other memorabilia among collectibles for other sports. Every time I’ve gone to The National, I’ve found everything from vintage cards, to cheap 1990s cards, to current singles, boxes and sets. In 2011, I lucked out and found a bunch of team-issued hockey sets of NHL, minor league and junior teams; some dating back to the early 1970s! In 2013, I found a bunch of uncut sheets of Oilers and Flames cards issued by Red Rooster in the 1980s. In 2015, I found some unused tickets from the 1992 Stanley Cup Finals. My point is, you will find things you want…and things you didn’t even know that you wanted. Sometimes, the best deals you find on hockey cards are from dealers who don’t specialize in hockey. 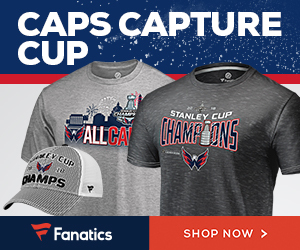 They tend to not have as much invested, emotionally or monetarily, in whatever hockey items they might have, so a lot of times you can get a good deal. 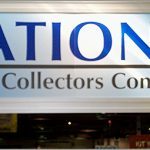 It is easy to walk right by some dealers at The National because it seems that they don’t have anything you want. And with so many tables to look at, this can be a great time-saver. At the same time, it might be worth it to slow down. For example, one year at The National there was one dealer who had five tables of autographed baseballs. I’d see his booth and walk quickly past it because I don’t collect baseball. I knew that I could breeze by his booth and not miss anything. Or so I thought. On the last day of the show, I was slowly making my way to the exit to go home. 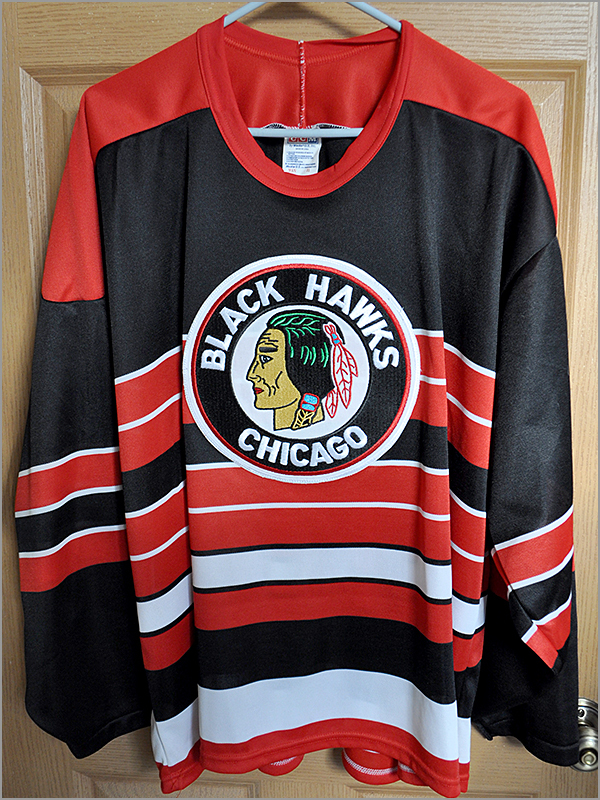 Strolling past that same dealer’s booth, I spotted a Chicago Blackhawks “barber pole” replica throwback jersey from the 1991-92 season. How I missed it the previous four days, I don’t know, but the dealer — who was selling it for his friend — was happy to give it to me for a great price. And to think that I found a jersey that I actually really wanted from a dealer with five tables of autographed baseballs. I will be at The 2017 National all five days this year, writing about the show and hopefully finding a few new treasures for my collection. But one of the most fun activities is talking to other collectors who love hockey. So, if you are at the show, and want to trade cards or just talk hockey, hit me up. 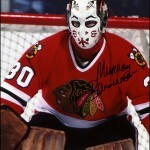 You can text or call me at 312-320-4378, send me a tweet or DM on Twitter @puckjunk or email me at sjb@puckjunk.com. 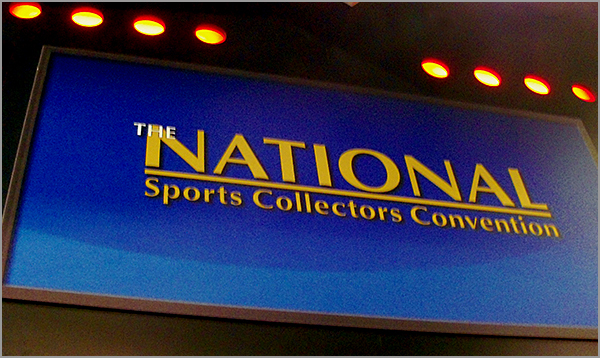 Visit the National Sports Collectors Convention website at nsccshow.com. Who’s Going to The National this year? Next Next post: The Showcase Showdown!